I’m calling these “Valentine Cupcakes” because that’s what I first made them for, but they can of course be made for any reason at any time. The main trick to making these cupcakes is simply a technique used with the batter. You can really use any recipe that you like. I’ve included the recipe I used, which worked out very well and can be adapted any number of ways. 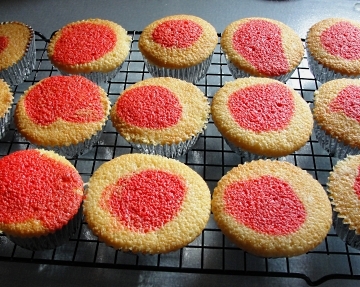 I’m also including the recipe for the frosting that I used, because it is very yummy and goes well with these cupcakes. In a medium bowl, cream together the sugar and butter. Beat in the eggs, one at a time (thoroughly), then stir in the vanilla. Combine flour and baking powder, add to the creamed mixture and mix well. Finally stir in the milk until batter is smooth. Pour or spoon batter into the prepared liners. Bake for 20 to 25 minutes in the preheated oven. Cake is done when it springs back to the touch. To be honest, my first attempt at making these was a bit of a mess. I used the foil liners in a jelly roll pan and over-filled them. Everything overflowed and it was a challenge to save them. I was able to use them with the camouflage help of the frosting, but I learned a valuable lesson. It is better to under-fill than over-fill! These tend to puff up like a muffin so only fill the liner to 2/3 or less. You can always make them taller with the frosting! Here is the ‘technique’. You can either split a normal 12 cupcake recipe in half or make a 2nd recipe with a different flavor and make twice as many cupcakes. I’ve made them with the above recipe plus a box strawberry cake mix and also with just the above recipe. Whichever way you do it, you want to have 2 different colors at a minimum and it works best with 2 different flavors, too (use the stronger flavor on the inside). If using one recipe, split the batter in half and add color and some flavored extract to one half. First, fill the cupcake liners 1/3 full with the first flavor (I use the white cake mix for this part, it will be what is on the outside of the cupcake). Then put the other half of the batter into a decorating bag with a round tip or into a baggie with the corner snipped off. Place the tip into the middle of the batter in each liner and squeeze until the liner is 2/3 or a little less full. You will have the first color on the outside and a circle of the 2nd color on the inside. I haven’t tried it yet, but I think it would be fun (though time consuming) to use multiple colors and make a rainbow cupcake. You could just pipe one color after another into the center in smaller amounts. If anybody tries it before I do, let me know! I think my next experiment will be vanilla, then a little bit of chocolate, then raspberry in the middle. So many possibilities! I obviously don’t have perfect circles here. It bothers me, but I’ve moved on. 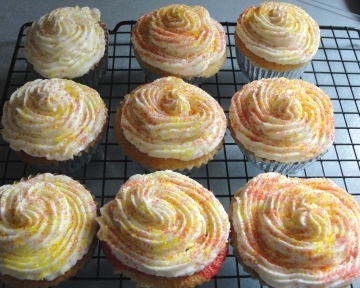 :-) I just swirled the frosting on top of the cupcakes with a star tipped decorating bag and added some colored sugar. The frosting recipe above is somewhat room temperature stable, but you will want to store any leftovers in the fridge. You will most likely not need to double that frosting recipe to frost 24-30 cupcakes. I had quite a bit left over, personally. It’s not a cheap frosting to make, so you might want to pick up some strawberries or other fruit to use up the extra frosting as a yummy fruit dip! These sound heavenly! Any frosting with creamcheese in it has to be good.